This project was established in 2001 by the Annenberg Foundation to advance public understanding of and appreciation for democracy and to address current affairs, mostly concerning the US. Divided in topic and sub-topics, users can learn a lot about the Constitution and the Supreme Court, Economy and Free Speech, and many more issues of vital importance for citizen participation in today’s life. 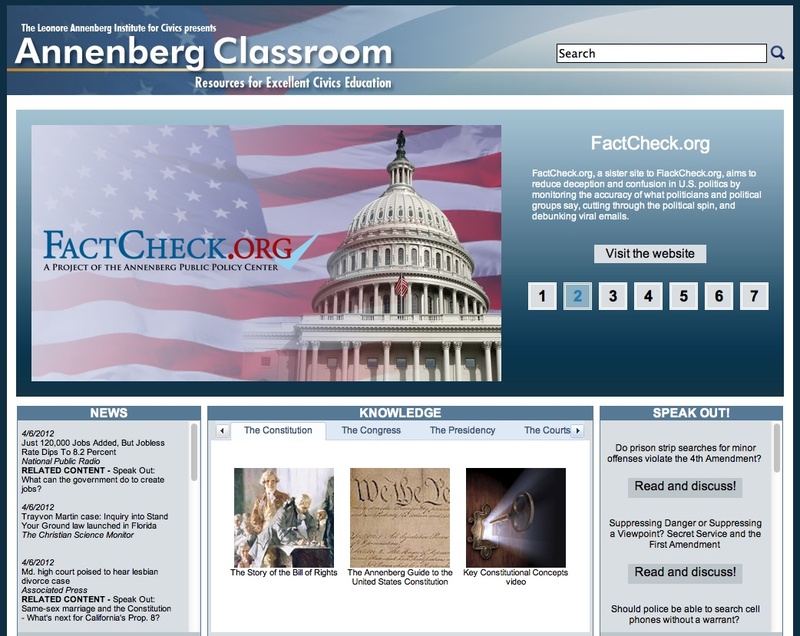 The Annenberg Classroom content is provided by its several-partner network, including the National Constitution Center, Student-Voices, FactCheck.org and others, thus providing a vast collection of inter-related info and resources. Each topic or section offers in fact access to a series of resources directly provided from or pointing to the various partner organizations. Aiming at teachers and student of any level, this website features a great level of usability, including many graphical elements, photos and visual aids, as well as window and roll-over menus: a dynamic structure providing a positive experience for any user. It also features an advanced search facility and many audio, video, and full-text lesson packages ready for free downloading. Among its interactive features, users can freely join various discussion fora, ask the expert or a Supreme Court Justice or browse a comprehensive library, spanning from history to language arts to science and technology.